Our first product, AnnaMaria's Red Pepper Jam, is an old Italian family recipe, made with as many locally sourced ingredients as possible and handmade in small batches. Our jam pairs wonderfully with cheeses and meats, but can also be used as a traditional jam, on toast or with nut butters. The peppers come from two New Jersey farms, and the wine is from North Fork Vineyard on Long Island. The jam is sold with local Cabot clothbound cheddar cheese from Vermont. Our new jam flavors will be based on grapes and pears grown in the tri-state area. This business came about because I first shared this red pepper jam on a cheese plate with a family friend, who happens to be the manager of a well know purveyor in NYC. He liked it so much that he ordered two cases from me to see what his customers would think of it, and the jam sold out in a week. 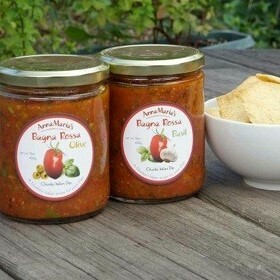 When the same happened with the next two cases, I started my company- AnnaMaria's Red Pepper Jam. We believe the best way to share a product is to talk with customers directly to find out what they love and how to feed them in the best way. My mother, who helps me make this jam, and I emigrated from Torino, IT, where the best place to shop for food is at farmers markets. This is our old country recipe, and we'd like to use our old country tradition of farmers markets to share it with the public.